The following is an excerpt from the letter of DOIW to the Women’s International Democratic Federation (WIDF), about the current situation of women in Iran. “The Democratic Organisation of Iranian Women, as one of the oldest members of this Federation, conveys its sincere greetings to you on the occasion of the 70th anniversary of the foundation of the Women’s International Democratic Federation – one that has been part and parcel of the history of heroic struggle of women of the world for liberation from class oppression under capitalism; and the struggle for social, economic and political equality. Today, the determining role of women in advancing peace and the struggle for preventing war, the environment, and ending all forms of violence, is compelling evidence of the Federation’s role in the heroic struggle of women worldwide. We follow the Federation’s activities in our meetings, and we fully support its struggle against imperialist aggression, neo-liberalism and oppression, and for justice, peace and socialism. While we wish you success in all your campaigns, we wish to bring to your attention, once again, the developments in Iran and the catastrophic conditions under which the women of Iran conduct their courageous struggle under a deeply misogynistic regime and its imposed medieval laws. As you know, the women of Iran have played determining roles in the political developments of our country in the last century, and their role did not only leave its mark on our country, but became a model for the rightful anti-dictatorship, anti-imperialist struggles of the people of the region. The participation of the millions of women of these countries in the liberation struggles in the region, their fight against theocracy, participation in the popular movements of the Arab countries and the armed struggle against the horrific crimes of ISIL (Daesh) and their ilk, and their struggle for freedom from dictatorship, reaction and foreign intervention. The women of Iran played a major role in the popular movement of 1970s which led to the 1979 Revolution. They participated in the mass demonstrations that were met with bullets from the Shah’s army, and in the widespread workers’ strikes as well as the armed struggle in the days before the fall of the Shah’s regime, and there was no aspect of the revolution where women did not play a determining part. Although the Iranian Revolution succeeded in its political stage and overthrew the monarchy, the leaders, headed by Khomeini betrayed the aspirations of our people’s movement and very soon the regime of monarchy had given way to the rule of a medieval regime based on religious law and deeply misogynistic. Among the difficulties that our citizens face are the adherence to neo-liberal economy contrary to the interests of the working people; and in the service of big capital in the country, was accompanied by intensification of sexual exploitation of women and passing of inhumane laws against the interests of the women of our country. 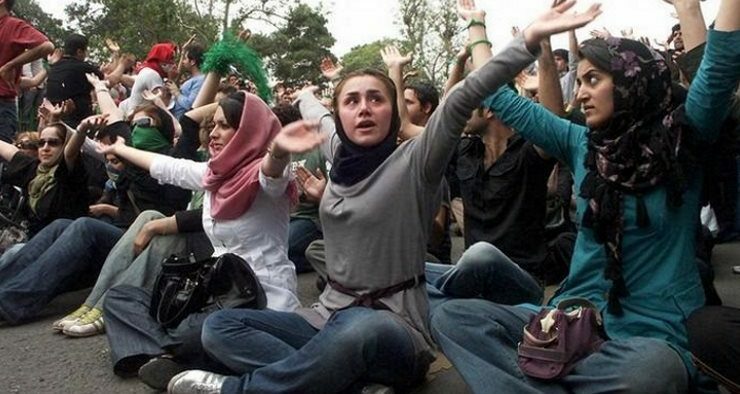 The arrest and execution of a large number of women activists and freedom seekers and the renewed oppression of trade unions and political organisations, are among the disgraceful catastrophes that the dictatorial regime of the Islamic Republic brought about for our people in the 1980s. Despite all the pressures and oppression of the last 37 years, the independent movement of the Iranian women has matured, become stronger and aware; and the victories of Iranian women in social and civic fields, has succeeded in delivering renowned women in the social and scientific fields. The suppression of women intensified. ‘Gender-based quotas’ were assigned in the country’s universities with the aim of limiting the number of women in universities. In addition, the medievalist and misogynist regime continues to devise and implement the most humiliating and discriminatory laws against women, interfering in the most private aspects of their existence. The leaders of the regime expound the view that “we must distance ourselves from Western ideas on issues such as employment and gender” (Khamene’i), and the “the place of women is in the home and at the service of the husband”. These are typical statements from the country’s leaders about women. Even the women’s achievements in universities, in the face of all the odds stacked against them, have not resulted in a greater share for women in the economic arena. While the statistics show that the number of women graduates is twice men, the Islamic Republican regime is intent of prevent women from entering the economic life of our country effectively, by introducing directives such as the “ban on employment of unmarried women” in offices and similar bills. The result of such destructive policies is evident in the employment rate of women which has dropped by 12% in recent years, and in 20 provinces the rate of unemployment among young women has shot to above 40%. According to the country’s Centre for Statistics the major share of the drop in economic activity belongs to women. During the past year alone, 550,000 women have left the job market and according to the official statements, 80% of women heads of household are unemployed. While the need to meet the family’s financial needs is one of the main reasons that women enter the labour market, women from the middle and lower income groups are driven from the formal sector to the informal sector, to temporary and zero hour contracts and with very low pay, where there is no legal oversight or control and where they have to give in to the most unjust conditions. “Women of Iran are suffering violence perpetrated by the state in order to subjugate them as the personal property of men and dependent on them. 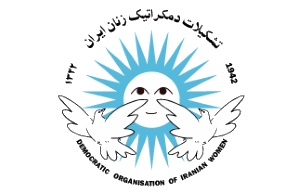 The regime has been intent on forcing women into the home and to bow to medieval beliefs enforced by suppression and the passing of misogynistic laws and directives, among them: Bill of protection of those who act on ‘Enjoining Right and Forbidding Wrong’ (a requisite from Quran which invites Muslims to impose the Islamic doctrine to those around them – this is used as an official sanction to fundamentalists to terrorise women), the Comprehensive Plan for the Population and the Enlightenment of the Family (the duty of bearing children by the order of the Supreme Religious Leader), Preservation of Chastity and Modesty Bill (reduced number of permissible working hours and deduction of pay in cases where women’s hejab is deemed to have been defective, women to avoid socialising with men in the workplace), increase in maternity leave without job security on return to work (according to the official papers, in a period of 18 months, out of 145,000 women who took maternity leave, 47,000 were fired on return to work); the Bill reducing the permissible number of hours a woman may work and the legal ban on employing unmarried women in offices; denying women many of the rights they had gained after decades of struggle namely the right to divorce, custody of children, free choice of clothing, or even attendance at sports stadia and fields are denied the women of our country. A woman is required to obtain the permission of her husband in order to work, study, have a home, obtain a passport or leave the country (for example, in recent weeks Niloofar Ardalan, the captain of the women’s football team which became the champions of Asia, was not allowed to leave the country and was thud denied the chance to play at the Asian games because her husband would not grant her permission). These laws are in breach of the International Declaration of Human Rights and the Convention on the Elimination of All Forms of Discrimination against Women; and other international agreements. The Convention state: States Parties shall take in all fields, in particular in the political, social, economic and cultural fields, all appropriate measures, including legislation, to ensure the full development and advancement of women, for the purpose of guaranteeing them the exercise and enjoyment of human rights and fundamental freedoms on a basis of equality with men” (Article 3). The Beijing Declaration for Action, 1995, highlighted violence against women in one of the 12 strategic objectives and actions it identified. Governments were required to take measures to reduce violence; and in one of the eight aims of the Millennial development plan, they are to eradicate poverty based on sustained growth, realisation and promotion of gender equality and women’s empowerment as effective means of achieving human rights in the world. These anti-women and backward laws have created serious social and psychological problems – the rise in cases of depression, suicides, drug addiction, prostitution, homelessness of women, and overall increase in women’s poverty are some of their consequences. “The suppression in Iran is not at work only in the legislative and judiciary sector, but it is evident in other spheres too. The acid attacks on women, conducted by fundamentalists continue. We wrote about this in a previous letter, and today, one year on, the perpetrators of the spate of acid attacks have not been arrested and the regime is not trying to identify and bring them to justice. Women’s movement and civil activists, and researchers are intimated and arrested arbitrarily. All these measures are aimed at creating an atmosphere of fear in order to increase the remit of security forces and prolong the life of the Islamic Republic. This is a system that sees its survival tied to the suppression of workers, teachers, nurses, students, religious and ethnic minorities. At present many are continuing their struggle in the Islamic Republic’s prisons. In recent days we have witnessed the death in custody of the imprisoned worker Shahrokh Zamani, and there are a large number of teachers who have been arrested in recent weeks. Twenty-seven years on, the families of the more than 4,000 political prisoners who were summarily executed in 1987 by the Islamic Republican regime and buried in mass graves, are yet to find out how and why their loved ones were sent to their deaths and they are still not allowed to publically mourn their deaths and commemorate them. Political prisoners in Iran are deprived on the right to independent defence counsel, to a fair trial, to contact with family and other rights. Narges Mohammadi, the civil and human rights activist, who contracted muscle paralysis in prison, has been returned to prison and is denied contact with her two young children. Bahareh Hedayat, student and women’s activist was also incarcerated illegally for two years beyond her term of imprisonment; Maryam Akbari-Monfared one of the protestors of the rigged elections of 2009, was given 6 years prison term and is still deprived of the right to prison leave and to medical care. Fariba Kamal Abadi and Mahvash Shahriari, of Baha’i faith have spent 7 years in prison for their religious beliefs and are deprived of the right to prison leave. Atena Farghdani, civil activist and cartoonist was subjected to virginity tests because she shook hands with her lawyer in prison. This is against the background of the World Health Organisation’s demand that governments end virginity tests and Amnesty International has recently equated its practice to sexual violence and torture. “The brave women of Iran fight for the repeal of discriminatory laws, based on gender or class, for Iran joining the Convention on the Elimination of All Forms of Discrimination against Women, and together with all progressive forces of Iran, they demand the freedom of all political prisoners and the end of executions. According to reports from HRNA, the news outlet of human rights activists in Iran, twenty women are held in Evin prison with political-security charges. They have been sentenced to around 180 years imprisonment.